Think of a name for your podcast before launch. Do searches on Google for the prospective name to see if anyone has the same or a similar name. It’s usually best to avoid similar show names. 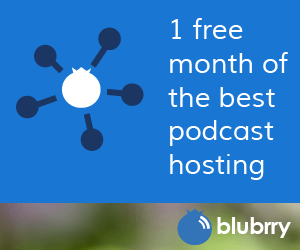 Even if you have a service that provides a domain (example: mypodcast.blubrry.com), it’s always good to have a unique domain name for your show (example: mypodcast.com). This way, if the service you are using changes, your unique domain will maintain your established brand. Every podcast should have 3000 x 3000 pixel JPG cover art (the current Apple iTunes recommendation). Many directories, especially iTunes, will use this image to link to your show. Think about the image and how it relates to your content. Make sure it is not too busy and that it is simple to view at smaller resolutions such as a thumbnail image or on a smaller mobile screen. Consider a branding image that is unique; one that will stand out in directories. And if the old-style microphone logo pops into mind, you might want to think again. Make sure your images are designed and saved for screen viewing (not print) using RGB color space. RGB (Red-Green-Blue) is the color of the light that is emitted from the screen to represent a pixel of the image. The color space to avoid is called CMYK (Cyan, Magenta, Yellow, Black), it is the color of ink used for printing. Often podcasters are not aware of the difference and use images for printing as their podcast artwork, resulting in poor quality images when resized and/or viewed on various screens and devices. Treat the image as if it could be displayed on a TV screen. Plan on the lower and upper third getting cut off by things such as advertisements, screen tools, or player buttons and features. The most common are Web-based player controls that display your podcast artwork behind a semi-transparent bar containing play, pause and other controls across the bottom. Important text and logos should be able to overcome such clipping from the top and bottom of the image. Make sure your images look good scaled down to as small as 60 x 60 pixels. Text might not be readable but the logo/text should still be recognizable. iTunes scales images to as small as 30 x 30. IMPORTANT: Your iTunes image should be saved in JPEG (.jpg) format to optimize the file size. A detailed PNG format image at 3000 x 3000 will typically exceed 1MB in size, which is known to cause issues with applications including iTunes. More importantly, the larger the file is the longer it takes to load. In certain circumstances, such as a logo with only a handful of solid colors, the PNG version of your artwork may be smaller than the JPEG version. In this situation, it may be ideal to use the PNG version. Keep in mind that most podcast directories including iTunes will save smaller versions of your logo in JPEG format regardless of the format you choose. iTunes specifically creates 600 x 600, 100 x 100, 60 x 60 and 30 x 30 versions saved in JPEG format. iTunes podcast artwork must be a square image in either JPEG or PNG file format (JPEG recommended) in RGB color space with a minimum size of 1400 x 1400 pixels and a maximum size of 3000 x 3000 pixels. A 3000 x 3000 image is recommended for targeting the Apple TV podcasts app. Google Play Music podcast portal artwork must be a square image in either JPEG or PNG file format (JPEG recommended) in RGB color space with a minimum size of 600 x 600 pixels and a maximum size of 7000 x 7000 pixels. Image must be at least 1200 x 1200 to be eligible for featuring. If your podcast’s image is smaller than 1200 x 1200 pixels, you’ll see a warning when adding your podcast. Note: iTunes podcast artwork of size 1400 x 1400 though 3000 x 3000 may be used as your Google Play Music podcast portal artwork. The best place to get your podcast artwork is from your graphic designer. If you do not have your own graphic designer, you may want to hire someone to do the task or use one of the many online resources available to create your own show’s artwork. We recommend checking out the Free Online Logo Maker by Canva. Design or pick a website theme and incorporate your logo and colors. Though this sounds difficult, remember to keep it simple. Website themes and other options are explained in detail in the Your Website section.